Save 20% off the MSRP of Unitron’s 15854 LED Ring Light. To take advantage of this discount, just add the 15854 to your shopping cart. Our Featured Product promo is valid Monday, December 11, 2017, through Friday, December 15, 2017. 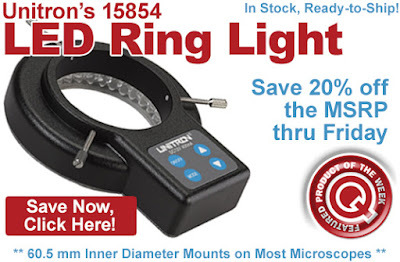 The 15854 LED Ring Light fits any stereo microscope with a diameter of 60 mm or less and is great for observing circuit boards, electronics, and highly reflective specimens. Visit the 15854 product page for more detailed information. Click here to purchase the Unitron 15854. For further questions, call us (800-966-6020), or send us an email. Please note: This promo is valid only at QSource.com.